Pancakes are for weekends around these parts. Hubby usually asks for them and I abide, it gives me joy to make loved ones happy with my food. Sometimes we make crepes or French toast to change things up a bit, or if I’ve been baking we enjoy a crisp or crumble, muffins, cupcakes or other creations. But the average weekend it’s pancakes, either on Saturday or Sunday unless we’re out of town or have to get out the door early. Despite that, it took me a year of blogging to finally post a pancake recipe because I never followed one and just mixed ingredients together until I got the batter consistency I liked, as my mama always did and still does to this day. Then one day I decided to measure and it set off a pancake recipe testing marathon. Oddly enough, measuring yielded horrible results the first few tries, until I figured it out. This was one of the successful outcomes and there are plenty more to come. I was meant to share this last Friday, but then #nationaldonutday (I assume in the USA) crept up on me on Instagram and I couldn’t help but participate with these. Now that blueberry season is in full swing, they occupy a permanent spot in my refrigerstor, right next to the strawberries. Blueberries are famous for their antioxidant benefits, of which they are a plentiful source. Antioxidants help protect us against free radical damage. I’ve mentioned this a few posts, but what does this really mean? To simplify things, free radicals are like rebels running rampant in our bodies. They are unstable atoms that seek stability by robbing electrons from nearby molecules causing a chain reaction. A certain amount of them is natural and sometimes our body produces them as an autoimmune response to fight viruses or infections and our body’s defense mechanism is designed to routinely hunt them down. However, free radicals increase with age, when we are exposed to pollution, radiation and chemicals such as cigarettes smoke, pesticides and herbicides. They can also arise from oxidative stress, such as the oxidation of oils and fats in the body. While our body is equipped to handle some free radical activity, the problem occurs when they start damaging living cells and DNA and when we lack the necessary antioxidants to defend us against this damage. Enter micronutrient antioxidants to the rescue. Antioxidants are molecules that react with and neutralise free radicals preventing them from doing harm. While the body has a certain defense system in place, it can’t produce the principle antioxidant micronutrients like vitamin A, E, C and beta carotene, so it’s important that we get these from food. Blueberries, as mentioned before, are a rich source of antioxidants including vitamin C and several antioxidant phytonutrients, which is their claim to fame. In fact they are right at the top of the antioxidant rich food list. They are also an excellent source of dietary fiber, vitamin K, which is essential for healthy blood clotting, and manganese which helps keep bones strong. Blueberries have a myriad if other health and nutrition benefits, but let’s mot forget that they’re also delicious. Bonus! Heat a pan over low medium heat. Line a tray with parchment paper and preheat oven to 100 C. Place the parchment paper line tray in the oven. Toast the coconut chip topping by putting them in a small dry pan over low heat and letting them toast until they are golden. Transfer to a bowl and set aside. 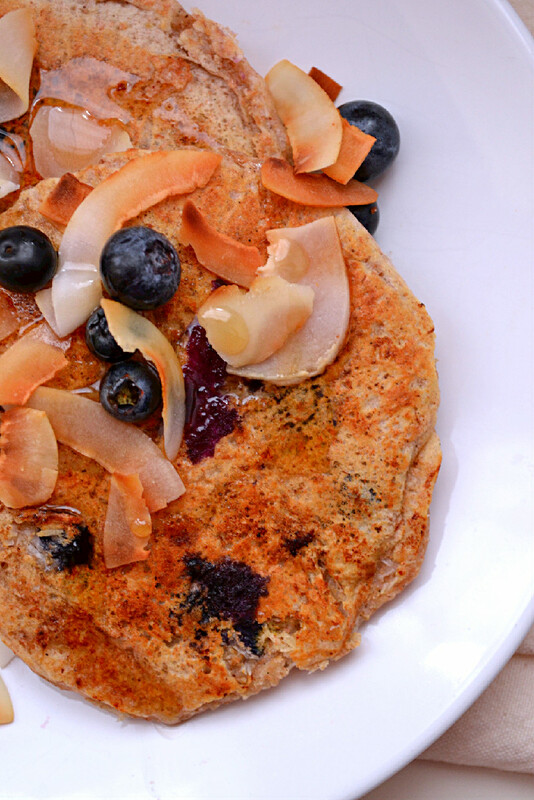 Mix dry ingredients in a large bowl, except for blueberries and toasted coconut topping. Mix all wet ingredients, except for apple cider vinegar, in a separate bowl, then add to dry ingredients and mix with a spatula to form a smooth batter. Gently stir in Apple cider vinegar, and watch the batter rise slightly. Lightly brush the hot pan with coconut oil and reduce heat to low. Pour a ladle of the batter, approximately 1/4 c at a time (use a shaper cookie cutter if desired, you’ll get thicker pancakes that way), into the hot pan, add 5-6 blueberries and push them down into the batter, let the pancake cook until air bubbles form at the top and the edge is somewhat dry. This will take 3-5 minutes depending on the strength of your heat. Flip and cook on the other side for a minute or two. Then remove from pan and place on the tray inside the oven to keep warm. Repeat until you no longer have batter. 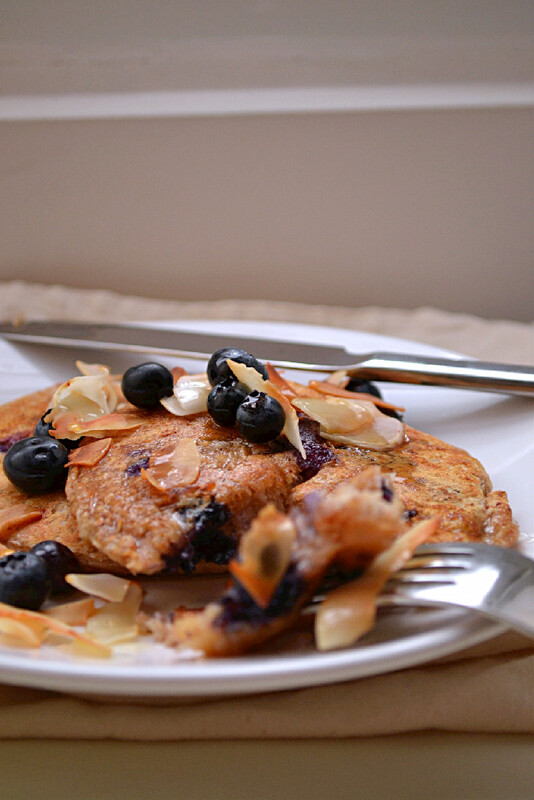 Serve with toasted coconut chips, fresh blueberries and pure maple syrup. Thanks Teffy. 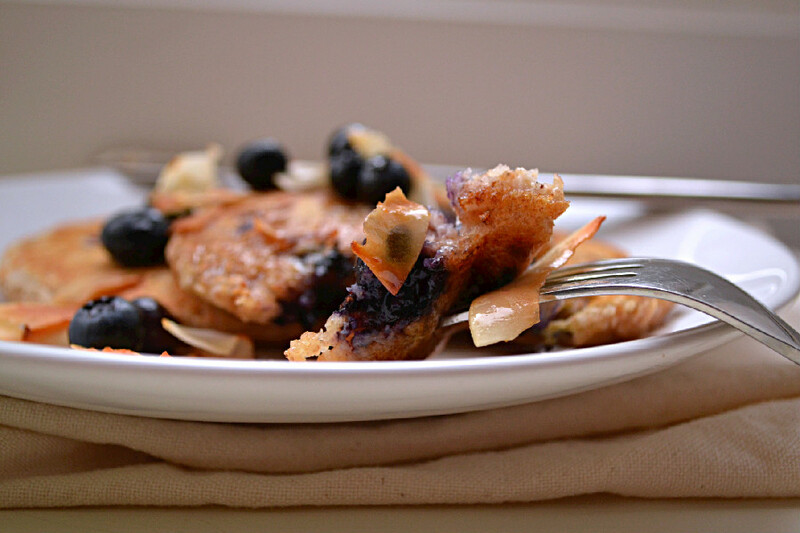 They’re quite delicious and perfect for brunch when blueberries are in season. Hope you can give them a try.